Running Club usually meets at lunchtime on Wednesdays. It is open to all Year 4 to Year 6 pupils. All ability levels are welcome, so whether you are a complete beginner or an Olympic gold medallist come and join us.. We also compete on some Saturday mornings throughout the year at various Sheffield schools cross country events. If you have any questions please see Miss Mossman, Mrs Woolley, Mr Pummell or Mrs Timms. The final Sheffield schools cross country event of the season took place on a cool morning in Graves Park. The fixture also marked the farewell appearances by race veterans Elizabeth, Frankie and Josephine before they move to secondary school. These competitors, along with James, Lucy and Charlotte who were unable to run today, have between them represented Mosborough Primary School many times. We thank you for your efforts and hope you look back upon these wet and muddy Saturdays with fond memories! Also racing this morning was Finn, who navigated the water hazard with ease. Time for a rest. See you next season! Storm Erik's deluge had already partially passed but wind speeds of 50mph remained to greet today's runners at Concord Park. Staying in bed would definitely have been the easy option to take this morning however Elizabeth and Lucy decided otherwise. An initial downhill slope guaranteed a rapid start to the race. The inevitable climb towards the finish line was impeded by prevailing headwinds. Regardless of finishing positions, everybody who took part today demonstrated the determination and resilience to defeat Erik. Congratulations to you all! A crisp, dark morning witnessed the resumption of the cross country season following the winter break. Over six hundred competitors gathered on the slopes overlooking Brunswick Primary School to test themselves. Among them, representing Mosborough, were Eva, Frankie, Grace and James. Conditions underfoot were firm, however the long downhill stretch at the start ensured an equally protracted climb at the end. Tireless efforts saw everybody cross the finish line and Frankie's assistance and encouragement of a struggling competitor up the final hill was particularly commendable! A grey morning, with distant hilltops shrouded in mist, saw the continuation of the cross country season. Early signs of the impending winter were apparent with the muddy slopes underfoot deteriorating as the morning progressed. Now that some of our competitors have moved up to the Year 5/6 race, they have the privilege and enjoyment of running two laps instead of just one. Solid performances were delivered by Elizabeth, Frankie and Finn. The thought of giving up never enters the minds of these hardy athletes! Race 2 of the cross country season was contended upon the varied terrain of Parkwood Springs on a deceptively sunny but cool Saturday morning. Grassy hills and leafy paths characterised the first half of the course. Eventually, these were superseded by a gravel track which provided a stunning, elevated view of north west Sheffield. The Mosborough Year 4 team welcomed Ollie to its ranks for his debut race. Year 6 saw the welcome return of James, who delivered a performance of grit and determination. Thank you to all the competitors and parents for attending and also Mrs Woolley for organising the school's participation. The starting gun for the new cross country season has been fired with a new venue at Bolehills Park. Cheered on by supporters in the park and local residents from the balconies of their nearby flats, hundreds of Sheffield's athletes stormed around the undulating recreation ground. Mrs Napier's class was particularly well represented with six competitors all taking part in one particular race (Frankie, Elizabeth, Josephine, Lucy, Charlotte and Jessica). Evie, Lola, Lucy and Polly raced on behalf of Year 4. However, the performance of the day came from Finn in Year 5, who finished in 7th place, a statistic all the more impressive considering he was running against older boys from Year 6! After the snow deposited by The Beast from the East had melted, the grand finale of the cross country season took place on a course that now resembled a slippery mudbath. 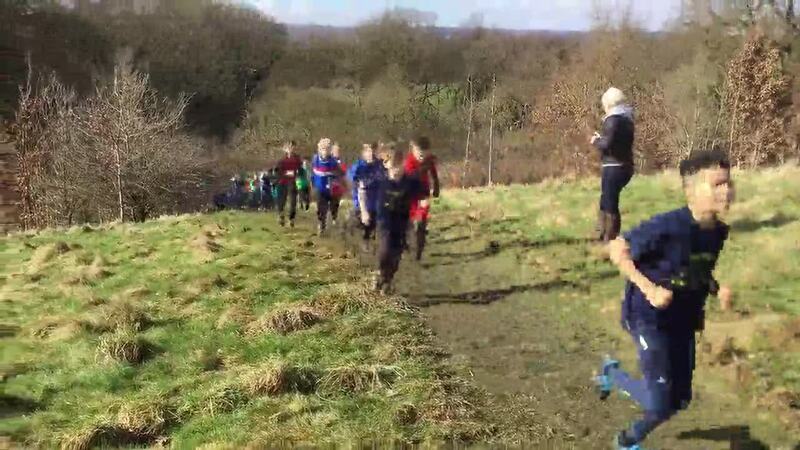 The Year 4's ran first and churned up the ground into an even boggier state for the Year 5/6 race that was to follow. Everybody made it up the steep hill on the home straight without losing any shoes this year but by the end of the morning there was not a clean person in sight! A splendid effort by race veteran Juliet in Year 6 marked her farewell appearance for the Mosborough team. Hopefully she will continue to enjoy the delights of cross country running as she moves to secondary school next year! Having first scraped the ice from their car windows, the Mosborough team made the short trip to Brunswick Primary school for the penultimate meeting of the year. As the morning progressed, the course became boggier with each and every race until, at the final hill, it was easier to move backwards instead of forwards! Finn achieved a commendable 8th place out of nearly 200 runners. Well done to everybody else who tried their best. Surely there will be some warm weather for the first time this season at the final event at Graves Park (again) in March? Sporting their new Mosborough bibs, which have been scientifically proven to make you run faster, Mrs Booth and her hardy team travelled to the hills of north Sheffield for the resumption of the cross country season. Despite the dull conditions, the fixture was well attended by competitors and spectators alike. Some sparkling Mosborough performances brightened the gloomy morning including Erin's demonstration of how to stay ahead of a pursuing throng. Time for just a short rest now before the next race at Brunswick Primary School in a fortnight. The mercury in the thermometer was still below the zero line but Frankie, James, Juliet, Lucy and Taliesin were all ready to race for Mosborough against a multitude of other Sheffield schools. Cross country running is a sport that requires great resilience and determination and this was shown in abundance by the whole team today. The mid-season break is now upon us but the races will resume at the end of January when the mornings will be lighter and hopefully just a little warmer! On an icy morning when other organised runs in Sheffield had already been cancelled due to adverse weather conditions, the Sheffield primary schools cross country runners showed that they were not going to be put off by the frost. Mosborough was well represented in all race categories with Louis demonstrating his potential to be a successful long distance runner with an impressive performance in his first race for the school. The hot chocolate at the end of the race was fully deserved! Bradfield was the venue for perhaps the most picturesque race of the season. However, unless you were a spectator, there was not any time to admire the scenery. The ground shook with every step as the competing pack sped past. Tal's unrelenting pursuit of those just ahead was notable. A commendable set of results was achieved by the Mosborough team. Thank you to everybody who attended, whether it was to run, encourage or organise. The Mosborough Primary School cross country team travelled to north Sheffield on Saturday for the latest challenge of the racing season. A bright, sunny morning ensured pleasant viewing conditions for the spectators but the hills were just as arduous as usual for the competitors. All our runners were a real credit to the school with strong individual performances throughout. Well done to Elizabeth who recovered from an early setback to finish her race strongly. Next stop, Bradfield! Mr Pummell, Miss Sanderson and Mrs Maxwell catching their breath following the Sheffield 10k on Sunday. Mrs Woolley took part too and ran so quickly she was probably back home before this photograph was taken! Mosborough Primary School's resident marathon runner Mrs Timms taking part in last year's Global Energy 10k at Rother Valley. Will she be even faster this year? The grand finale of the cross country season had arrived and spring was in the air. However if anybody thought that just because the winter months were behind us this would simply be a stroll in the park then they were certainly mistaken. Unbeknown to all runners the final hill featured a mud bath that Glastonbury would have been proud of. Full marks to Charlotte for her determination which helped her escape the mud trap that tried its very best to ensnare her. A special mention also goes to Alfie who did not let the minor inconvenience of losing a shoe in the quagmire prevent him from completing the course. I am sure that it will resurface in years to come! Thank you to all the competitors who have given up their Saturday mornings over the year to represent their school and to the adults who have supported them through thick and thin. It makes a big difference to know that there is somebody waiting to cheer you over the finish line. Cross country too has made it to the finish line for the year but the good news is that after school running club should be back soon to keep us on our toes. Temperatures close to freezing point were not enough to keep hundreds of resilient cross country runners in their beds last Saturday morning. Instead they chose to take on the challenge of Norfolk Park mountain and the steepest slopes encountered so far this season. The Year 4 girls race launched the event at a blistering pace which was hastily followed by the boys. Next, just as some spectators thought that the Year 5/6 races were coming to a conclusion, the runners with great perseverance kept their tired legs moving for a second lap! Congratulations to all Mosborough competitors. Your determination was reflected by your improved performances. The Mosborough Primary School team were up bright and early to attend the first Sheffield schools cross country race of the year. Within minutes the runners disappeared out of sight as they hurtled towards the mist shrouded hills. One by one they re-emerged including James who finished in 5th place out of over 200 competitors. A special mention also goes to Vincent for his impressive debut run for the school. Well done to everybody who took part. Three weeks to wait and we will do it all again! Dull, damp and dim describe the conditions at Longley Park on a dreary December morning. Then Miss Mossman arrived with her red shirted team of Mosborough Primary School cross country runners to brighten the day. A hilly course proved to be demanding but everybody rose to the challenge competing all the way to the finish line. Max's sprint finish was particularly noteworthy as he managed to close the large gap between him and the runner ahead to move up a place in the last few metres. Congratulations to the competitors and thank you to all the parents and staff who have driven the runners to the races and supported them enthusiastically throughout 2016. Time for the team to recharge their batteries over the holiday! R is also for "Running Club"